The Black Rapids Glacier runs for fifty miles (80.5 km) in the Alaska Range following the Denali fault. Along this route you can see several recent geological changes from the magnitude 7.9 November, 2002 earthquake -- one of the 15 most severe ever recorded on U.S. soil. Two of the largest recorded rockslides flow across the 1-1/2 mile (2.4 km) wide glacier and up the other side of the valley. Another interesting result of the earthquake can be seen where the stress of the quake blew the side off of a mountain filling the valley below it with rock scree for three miles (4.8 km). 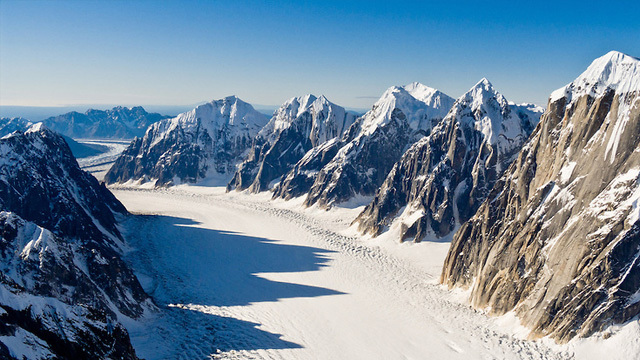 All of this and many other beautiful and interesting sights can be seen on our Alaska Range flight. Call our Alaska air service to go on a once in a lifetime Alaska flightseeing tour. For those who would like to see wildlife from the security of an airplane we recommend an Alaska wildlife viewing flight in the Super Cub. The Super Cub is more conducive for Alaska wildlife viewing tours because it flies slower and isn't as loud as larger aircraft. 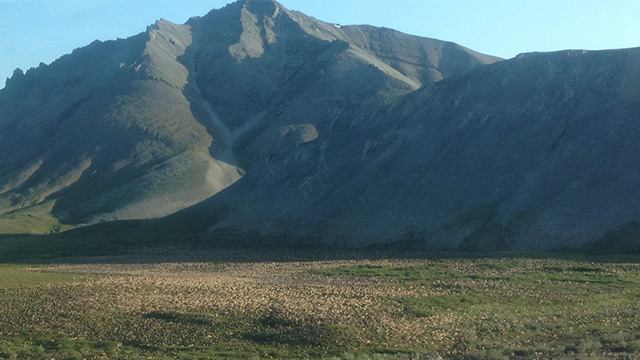 We have a Granite Mountain flight where Dall sheep, caribou, and possibly bears and wolves can be seen. As you cross the Tanana Valley you can see moose and one of the few free ranging bison herds in the U.S. 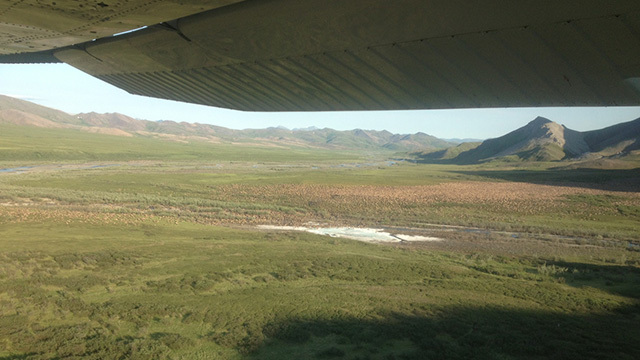 This flight also offers the opportunity to experience the beauty, vastness, and remoteness of Alaska's wilderness. 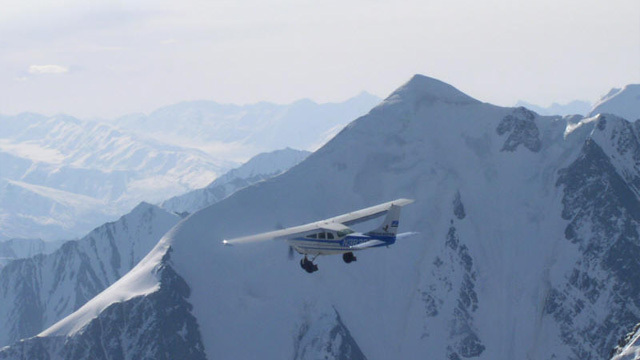 We offer the most amazing Alaska flightseeing tours around and our Alaska aviation company knows all the best points of interest. Flights can be customized to view such events as the calving of the Fortymile Caribou Herd or concentrations of moose in the fall during breeding season as well as many other Alaska wildlife events. 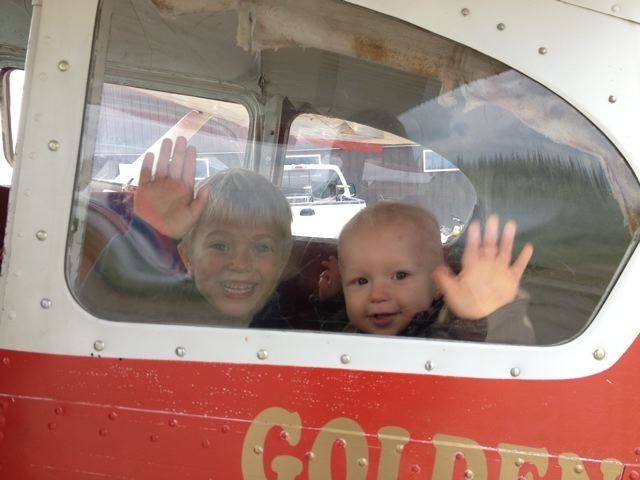 Golden Eagle Outfitters offers a variety of Alaska flightseeing trips to meet your needs. One- passenger flights are available in the Super Cub. Up to five-passenger flights are available in the Cessna 206. We would be delighted to show you some of the Alaska wilderness we know best! We have a wide range of Alaska wilderness tours that you can choose from. We run the safest and most knowledgeable Alaska air tours in this region. Please call our Alaska air service today or email for more information.